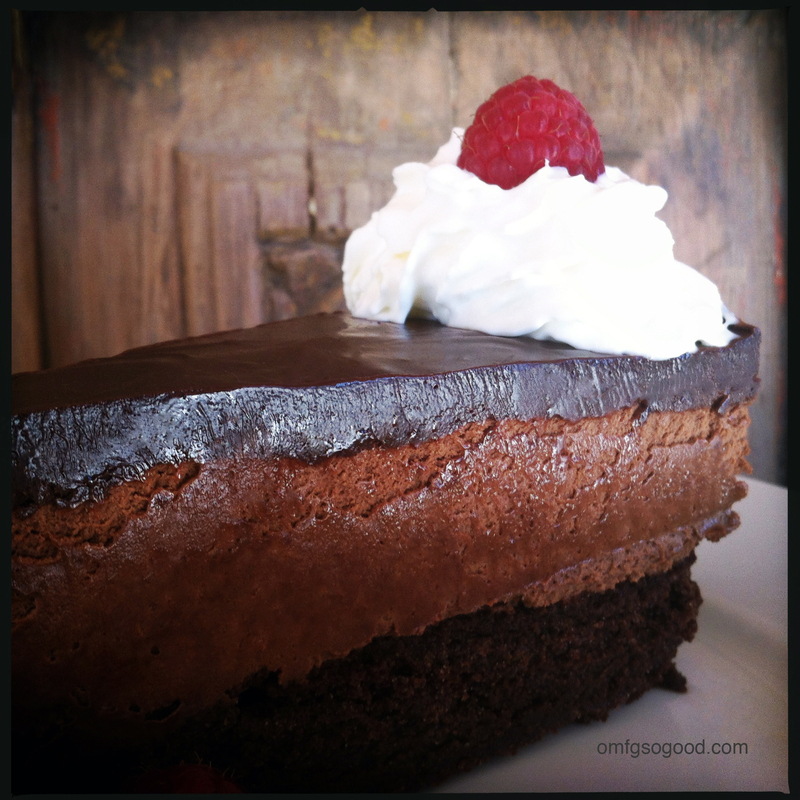 three layer chocolate mousse cake (gluten free) | omfg. so good. Your mission, should you choose to accept it, is to make this decadent triple decker cake… then eat it. But be warned, this one’s not for the faint of heart. Of course I replied out loud with “Okay, sure. That’ll be fun to make!” while, “Chocolate mousse cake? WTF? !” played on repeat in my mind. Now, I’m not one to back down from a challenge so I packed up the rugrats and trekked to the store to buy no less than 30 ounces of good quality chocolate and a fair amount of heavy cream. No, that was not a typo. 30 ounces. Of chocolate. Let’s do this. Melt the first 10 ounces of chocolate in a microwave safe bowl in intervals of 30 seconds each, stirring in between, until 75% melted. Remove from the microwave and stir to melt completely. Add the butter and espresso powder and whisk to combine completely. Set aside. In a large mixing bowl, combine the room temperature egg whites and half of the sugar. Start mixing on low, gradually increasing speed until the egg whites start to look fluffy. Add the remaining sugar, vanilla and salt, and continue mixing until the sugar has completely dissolved and you’ve reached soft-peak meringue stage. Using a whisk, mix the room temperature egg yolks into the chocolate/butter mixture. Using the whisk, fold 1/2 of the meringue mixture into the chocolate, then gently fold in the remaining meringue using a rubber spatula. Be sure to incorporate the chocolate batter from the bottom of the bowl, folding gently until no white streaks remain. For the mousse layer, place the second 10 ounces of chocolate in a large heat proof bowl. Bring 1/2 cup of the heavy cream just to a boil then pour it over the chocolate and stir to melt until smooth and shiny. In a small bowl, soften the gelatin in the cool water the microwave on low heat for 15 – 20 seconds to dissolve. Stir the gelatin until completely free of lumps then mix it into the chocolate. In a medium mixing bowl, mix the remaining 1 cup of heavy cream to soft peak stage. Stir the chocolate to be sure it’s free of lumps, then using a whisk, fold in half of the whipped cream. Using a rubber spatula, gently fold in the remaining whipped cream until evenly blended. Spread the mousse on top of the cake layer and return to the refrigerator while making the ganache. For the ganache layer, place the last 10 ounces of chocolate in a heat proof bowl. Bring the 3/4 cup heavy cream just to a boil then pour over the chocolate to melt. Add the Kahlua (or espresso powder) and stir to melt completely until smooth and shiny. Pour over the mousse layer and smooth with an offset spatula. Return to the refrigerator and chill to set for 4 – 5 hours. Before serving, run a sharp knife under hot water then run it along the interior of the springform mold, loosen and remove. Now, use a sword to slice and serve giant slices of this beast of a cake with fresh whipped cream and raspberries. Chocolate Beast Cake, you will never defeat me… I will simply eat you. As usual, your recipes look mouth-watering-amazing. Yum! Help! I just took the cake layer out of the oven and the top is crispy – not burned just crispy. Should it look like that? Did I do something wrong? I don’t want to continue and waste a bunch of chocolate and cream if the first layer is f’d up!